A highly active and stable oxygen evolution reaction (OER) electrocatalyst is critical for hydrogen production from water splitting. 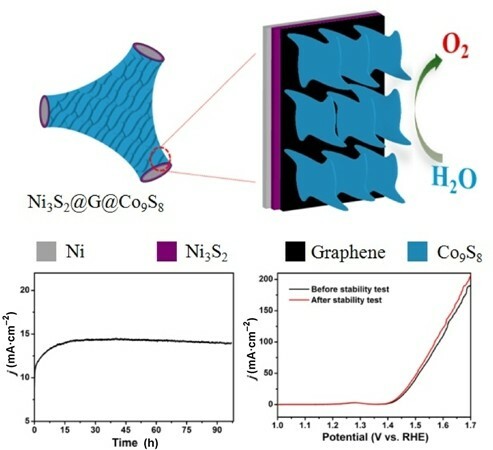 Herein, three-dimensional Ni3S2@graphene@Co92S8 (Ni3S2@G@Co9S8), a sandwich-structured OER electrocatalyst, was grown in situ on nickel foam; it afforded an enhanced catalytic performance when highly conductive graphene is introduced as an intermediary for enhancing the electron transfer rate and stability. 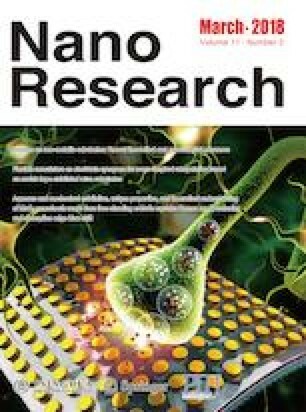 Serving as a free-standing electrocatalytic electrode, Ni3S2@G@Co9S8 presents excellent electrocatalytic activities for OER: A low onset overpotential (2 mA·cm−2 at 174 mV), large anode current density (10 mA·cm−2 at an overpotential of 210 mV), low Tafel slope (66 mV·dec−1), and predominant durability of over 96 h (releasing a current density of ∼14 mA·cm−2 with a low and constant overpotential of 215 mV) in a 1 M KOH solution. This work provides a promising, cost-efficient electrocatalyst and sheds new light on improving the electrochemical performance of composites through enhancing the electron transfer rate and stability by introducing graphene as an intermediary. Supplementary material (SEM, XPS and TEM measurements et al.) is available in the online version of this article at https://doi.org/10.1007/s12274-017-1754-5. The work was supported by the National Natural Science Foundation of China (NSFC) (Nos. 61525402 and 5161101159), Key University Science Research Project of Jiangsu Province (No. 15KJA430006), QingLan Project, National Postdoctoral Program for Innovative Talents (No. BX201600072), China Postdoctoral Science Foundation (No. 2016M601792).